In a political world where running against Washington has become one of the easiest paths to getting there, and where the ultimate outsider neophyte is president, Roy Blunt stands out as proof that the opposite approach sometimes still works. Few in today’s Congress have succeeded as well, and for as long, at the inside game — where influence is cultivated and sustained by combining broad political and policy expertise along with deep interpersonal skill. The standing that Missouri’s junior senator enjoys among the Capitol’s venerable Republican power players was newly reinforced by his return last week to the chairmanship of the Rules and Administration Committee. The normally lower-profile panel has an unusual number of hot-button issues on this year’s agenda including the future of the Senate filibuster, potential midterm voting fraud, sexual harassment on the Hill, and cybersecurity vulnerabilities not only at the Capitol but in the nation’s election infrastructure. One of his first tests will be legislation to restrict the ability of disgruntled senators to delay confirmations, their only remaining protest power in the years since the chamber did away with the 60-vote test for nominations. President Donald Trump wants a similar “nuclear option” to create a simple-majority threshold on legislation, but GOP leaders have ruled that out. As a consolation, Blunt is planning for his committee to advance a bill limiting dilatory tactics on potential federal judges and senior administration officials. Blunt has also been tapped to represent the Senate GOP leadership on the new Joint Select Committee on Budget and Appropriations Process Reform. By year’s end, it’s supposed to come up with a salable plan to fix the Hill’s badly broken mechanisms for setting fiscal policy and spending levels, which have proved immune to reinvention thanks to turf battles between the parties, between the House and Senate, and between appropriators and all the other members. Along the way, he’ll be tested along with all his fellow establishment Republicans on the Hill to blend loyalty to Trump’s agenda with skepticism about his temperament — a challenge made easier by the fact that Blunt does not face the voters again until 2022. For six years Blunt has been vice chairman of the GOP Conference, fifth on the leadership ladder. But the No. 2 senator in the hierarchy, Texan John Cornyn, is term-limited as party whip. If Republicans hold the Senate, by far the likeliest scenario is that the three lawmakers just below Cornyn would each move up one notch — John Thune of South Dakota to whip, John Barrasso of Wyoming to conference chairman and Blunt to chairman of the Policy Committee. But Blunt, a noncombative pro-business conservative, has not definitively ruled out challenging the more combustible and hard-line Barrasso for the No. 3 job of conference boss. Should the GOP lose its narrow majority, which for now still seems like a long shot, a comprehensive leadership scramble is assured and Blunt may well get pushed out of the high command altogether come January, when he’ll turn 69 and begin his ninth year as a senator. Such an outcome would be almost as much of a surprise as what happened to Blunt a dozen years ago — a downfall, on the other side of the Capitol, that for a time marked him as someone whose opportunism had gotten him in over his head and spoiled his reputation among a critical mass of fellow Republicans. 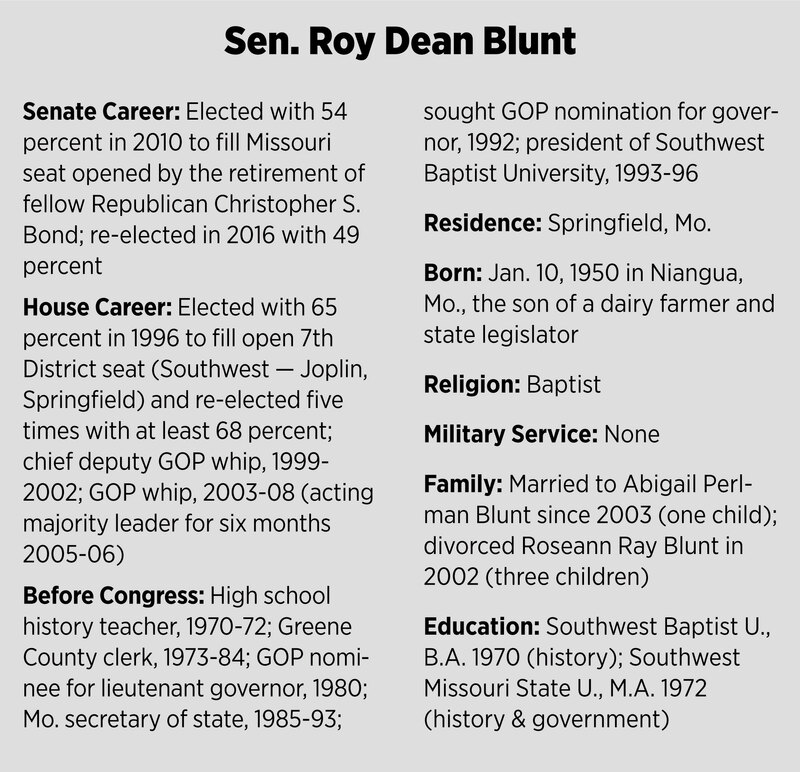 When Blunt was in only his fifth House term representing southwestern Missouri, he had risen to be majority whip and was widely assumed to be the next GOP speaker of the House. But he failed in spectacular fashion to execute the one intervening step, which was getting elected majority leader in early 2006 after his principal congressional mentor, Tom DeLay, left Congress under an ethical cloud. After issuing a news release declaring he had enough colleagues’ votes to assure victory, he was defeated 122-109 by John A. Boehner. Blunt had refused to give up the whip’s job to run, annoying plenty of ambitious colleagues. And two years later, his stature further weakened by his allegiances to a highly unpopular President George W. Bush, he dropped out of the House leadership and turned his attention to moving to the Senate in hopes of rebooting his congressional career. It has worked out mostly as he might have hoped. After easily winning an open Senate seat in 2010, he got named to the Appropriations, Commerce and Intelligence committees in addition to Rules, and after just a year as a senator was given his current job in leadership. He was also tapped as the Senate GOP’s chief liaison to the Mitt Romney presidential campaign. His new colleagues praised many of the same attributes that fueled his rise in the House: Aptitude as a dealmaker, skill as a conduit between Hill Republicans and the business community, a willingness to do favors for colleagues, and a cool under pressure. But his newfound comfort in the Senate got a significant scare two years ago. Blunt won his second term by just 87,000 votes (3 percentage points) even as Trump was carrying the state by 523,000 votes. The close shave came at the hands of Jason Kander, then the 35-year-old Missouri secretary of state, who emulated Trump’s anti-establishment playbook and labeled Blunt as a behemoth creature in a Washington “swamp” that badly needed draining. It did not help that all three of Bunt’s adult children are registered lobbyists, including former Gov. Matt Blunt who now represents the Big Three automakers. And the senator’s second wife, Abigail Perlman Blunt, is global head of government affairs for the Kraft Heinz Co.
Blunt’s reputation on the Hill has always been as a pragmatist, his default setting in favor of pushing for the most conservative outcome that’s achievable. That approach comes through on Appropriations, where Blunt is chairman of the panel in charge of the departments of Labor, Health and Human Services and Education — meaning it assigns more domestic spending than any of the other 11 subcommittees. Trump proposed a 12 percent cut to the programs under Blunt’s jurisdiction; the omnibus, enacted last month only because it attracted Democrats and Republicans with higher overall spending levels, provided a 10 percent increase instead. Rather than advancing a hard-line call for shrinking the social safety net, Blunt has pushed to ease enrollment in Pell grants and expand funding for the National Institutes of Health, for example. He’s also been in the minority of GOP senators to support the revival of expanded federal assistance for workers displaced by international trade.